A group of soldiers attempting to rescue a hostage from a terrorist crash land into unfamiliar jungles which are inhabited by a group of long hidden dinosaurs. Prehistoric animals emerge from a science lab and tear up most of Los Angeles. Fossil Ridge, once believed to be a cattle ranch is discovered to be a breeding ground for vicious prehistoric velociraptors. When the bloodthirsty dinosaurs escape, the townspeople must fight to survive the deadly raptors. A group of people brought together through a twist of fate hide out in a remote cabin, unaware that a ferocious monster roams the surrounding area. A small, secluded island off the coast of Belize suddenly finds itself terrorized by a deadly predator from the planet's distant past when deep sea divers accidentally awaken an ancient evil. 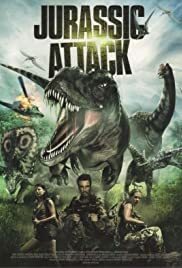 When their mission to capture a renegade general and a kidnapped scientist goes awry, a team of soldiers learn they've stumbled onto an ancient valley filled with live dinosaurs and must try to get away before they all fall victim to the creatures. This turned out to be quite an enjoyable effort that could be fun once it overlooked the cheesiness. There's a huge amount of that spread throughout here, once again featured from the absolutely atrocious and ridiculous CGI used for the dinosaurs that don't have any sort of consistent movement beyond three general attack behaviors throughout as well as the constant size discrepancies in the scenes and totally ridiculous-looking animation effects for the attacks. While these look really bad, and there's a couple problematic story lines in play that don't make any sort of sense at all, there's some fun here with a lot more action than expected, including a rather fun takeover of the rebel hideout in the jungle which devolves into a series of fun firefights that are pretty enjoyable. As well, with the creatures continuously on the group that leaves for plenty of high-quality confrontations and kill scenes to make up for it's shortcomings. Overall, this one wasn't too bad even with a few flaws. Rated Unrated/R: Graphic Violence and Language.